OS grid reference: SD 6153 1400. 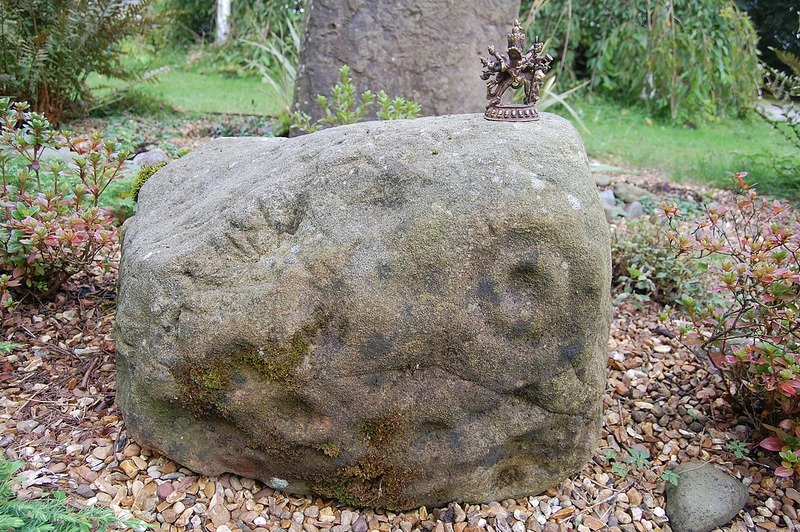 The small cup-marked boulder used to stand in a rock garden in the carpark of Anderton Hall Lodge on New Road just to the east of the village of Anderton, about halfway between the M61 motorway and Rivington reservoir. It had stood forlornly in front of a modern-day standing stone and a collection of non-discript rocks, and could have almost been overlooked. But the little boulder displays prehistoric cups and cup-and-ring markings, dating back thousands of years. Anderton village is a tiny suburb of Adlington, 1 mile to the west, while the town/city of Bolton is 5 miles to the north-west. The stone has recently been taken to the Anderton Leisure Centre further along New Road, close to the shores of Rivington Reservoir, I am now informed. 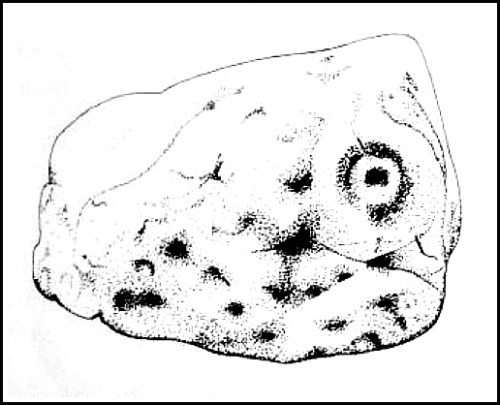 The small cup-marked boulder was found in the bank of Rivinton Lower Reservoir in 1999 when the water level was quite low; it seems that it had been used in the actual building of the reservoir back in 1850, but no one had noticed the significance of it at the time. It is said to date from the Neolithic age 2,000-3,000 BC. There are 14 tiny cup-marks and 1 larger cup-and-ring that forms an almost perfect curve, though now rather worn. The small boulder is roughly 1 foot 7 inches high and 2 foot 7 inches in length. But one must ask the question, what is it doing in the the Anderton Leisure Centre – why is it not in a museum where it can be properly protected and examined by specialists in the field of rock art. Really this ancient carved stone should be in the Bolton Museum. But, it seems this very fine prehistoric artefact has been forgotten or, perhaps, just ignored. For the time being it looks as if it will have to remain where it is inside the local leisure centre! [Thanks to my good friend Simon Mortimer for the excellent photo). Categories: Rivington Cup-Marked Stone, Rock Art | Tags: Rivington Cup-Marked Stone at Anderton in Lancashire | Permalink. AN KHENA says: Comment: What happened to all the others found with it. The long triangular piece came from Turton circle. Do some investigating. Leverhulme paid a farmer to take them away in his cart for his folly. They were most likely dumped there when a local historian start to ask where the standing stones on standing stone hill had gone to. The stones probably now part of the castle or in reservoir. Last time I saw the 4 stones on the lawn someone had smashed the most important one into 2 pieces and thrown it into a gutter. Maybe they annoyed the gardener. They dated to around 1,800bc or earlier. Where are the rest? It’s not actually there now. It’s inside Anderton Leisure Centre. I contacted them to photograph it last year. Thank you Linda for informing me about the stone being moved. I will up-date the site page for this. Thanks again. Ray. Hi Linda, would you have that photo that you took of the stone, still. I would like to put on this site page if that’s ok with you. Obviously, I would credit you on the photo. Thanks. Ray, could you put this post up on my FACEBOOK ‘LANCASHIRE DIARY’ page ? Okay John, I will put up the link on your Lancashire Diary page. Ray.